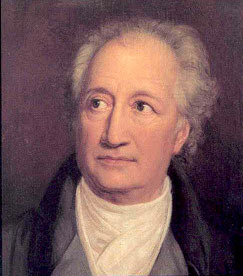 Johann Wolfgang von Goethe was the acknowledged prince of German poets, and one of the most highly gifted and variously accomplished men of the 18th century. He was born in the year 1749 at Frankfurt am Main, where his youthful years were spend. His father, Johann Kaspar Goethe, was an imperial councillor, in good circumstances, and in a respectable position. In the year 1765, he went to the university at Leipzig, of which Ernest and Gellert were then the most notable ornaments. As a student, he pointed, by external profession, towards the law; but his real studies were in the wide domain of literature, philosophy, and above all, life and living character. In the year 1770, he went to Strasburg, to finish his juridical studies, but here anatomy and chemistry, Shakespeare, Rousseau, and architecture - anything rather than the statute-book - occupied his mind and exercised his soul. Here it was that one of the earliest, certainly the most famous of those youthful love-adventures took place, which, in his biography, as in that of Robert Burns, play such a prominent part - the well-known affair of Frederica Briov of Seisenheim. With regard to these matters in general, it may be said that he was more readily moved to love than intense in love, and that the objects of his admiration generally seem to have had more reason to boast of the delicacy of his susceptibility than of the perseverance of his devotion. How far there was anything more than commonly culpable in these connections, will always be a question; certain it is that they will always tarnish to some extent the otherwise fair reputation of the poet. In the year 1771, the young poet, now 22 years of age, took his degree as Doctor of Laws, and went for a short while to Wetzlar am Lahn, the seat of the imperial chamber of the then German empire, and which afforded peculiar facilities for young men engaged in the study of public law. Here, however, as in other places, his knowledge of the human heart, and of human character, altogether overgrew his professional studies, with Wetzlar later forming the setting for The Sorrows of Young Werther. After returning from Frankfurt, Goethe spent some years in his native city, engaged chiefly in literary productions. His first great dramatic work was Götz von Berlighingen, published at Frankfurt in 1773 and later translated into English by Sir Walter Scott The play fictionalizes the life of an unscrupulous robber-knight of the 16th century, yet is said to have inaugurated the German literary movement known as the Sturm und Drang. The following year, Goethe published the famous Sorrows of Young Werther, a soggy rag ripped from the nose of the human soul, drizzled with a childish admiration for the gloomy fragments of James Macpherson's Ossian. Yet in the then state of European thought and feeling, Werther stirred the whole literary mind of Europe like a plangent sneeze sweeping over a forest. Once more it was the gospel that the world belongs to the strong, which lay beneath the surface of this romance. This, however, was not the lesson which was drawn from it by Goethe's contemporaries: they shed tears of sympathy over the lovelorn youth whose burden becomes too great for him to bear. While Götz inaugurated the manlier side of the Sturm und Drang literature, Werther was responsible for its sentimental excesses. In 1775, Goethe, who had the good fortune to gain the esteem of Karl August, Grand Duke of Saxe-Weimar, accepted an invitation from that prince to settle in his little capital, which since has become so famous as the Athens of the great legislative age of German literature. Here the poet became a petty statesman; and occupying himself in various ways in the service of his benefactor, passed quickly through stages of court preferment, till, in 1779, he became 'actual privy-councillor,' at the age of 30, holding the highest dignity that a German subject could then attain. In 1782, he received a patent of nobility, and in the following years, till 1788, travelled much in Switzerland and Italy. Following this period, Goethe published his Iphigenie auf Tauris (1787), Egmont (1788), Torquato Tasso (1790), and the Venetian and Roman Elegies. Of this last work, thoroughly German both in form and feeling, the heroine was Christiane Vulpius, a highly attractive though not a highly gifted woman, who bore him a child - his eldest son - in 1789; but whom he did not formally marry until 1806, when the invasion of Weimar by the French made him fear for both life and property. In his theatrical endeavors, Goethe found a sympathetic and encouraging critic in Schiller, to whom he owed in great measure his renewed interest in poetry. After years of tentative approaches on Schiller's part, years in which that poet concealed even from himself his desire for a friendly understanding with Goethe, the favorable moment arrived; it was in June 1794, when Schiller was seeking collaborators for his new periodical Die Horen; and his invitation addressed to Goethe was the beginning of a friendship which continued unbroken until the younger poets death. The friendship of Goethe and Schiller, of which their correspondence is a priceless record, had its limitations; it was purely intellectual in character, a certain barrier of personal reserve being maintained to the last. But for the literary life of both poets the gain was incommensurable. As far as actual work was concerned, Goethe went his own way as he had always been accustomed to do; but the mere fact that he devoted himself with increasing interest to literature was due to Schiller's stimulus. It was Schiller, too, who induced him to undertake those studies on the nature of epic and dramatic poetry which resulted in the epic of Hermann und Dorothea and the fragment of the Achilleis; without the friendship there would have been no Xenien (1795) and no ballads, and it was his younger friend's encouragement which induced Goethe to betake himself once more to the misty path of Faust, and, in 1808, bring the first part of that drama to a conclusion. Faust is a patchwork of many colors. It is possible to discriminate between the Sturm und Drang hero of the opening scenes and of the Gretchen tragedy - the contemporary of Götz and Clavigo - and the superimposed Faust of calmer moral and intellectual ideals - a Faust who corresponds to Hermann and Wilhelm Meister. In its original form the poem was the dramatization of a specific and individualized story; in the years of Goethe's friendship with Schiller it was extended to embody the higher strivings of 18th-century humanism; ultimately it became, in the second part, a vast allegory of human life and activity. Thus the elements of which Faust is composed were even more difficult to blend than were those of Wilhelm Meister; but the very want of uniformity is one source of the perennial fascination of the tragedy, and has made it in a peculiar degree the national poem of the German people, the mirror which reflects the national life and poetry from the outburst of Sturm und Drang to the well-weighed and tranquil classicism of Goethe's old age. The third and final period of Goethe's long life may be said to have begun after Schiller's death. He never again lost touch with literature as he had done in the years which preceded his friendship with Schiller; but he stood in no active or immediate connection with the literary movement of his day. His life moved on comparatively uneventfully. Even the Napoleonic regime of 1806-1813 disturbed but little his equanimity. Goethe, the cosmopolitan Weltbürger of the 18th century, lacked intense feelings of patriotism; and, having seen Germany flourish as a group of small states under enlightened despotisms, he had little confidence in the dreamers of 1813 who hoped to see the glories of Barbarossa's empire revived. Napoleon, moreover, he regarded not as the scourge of Europe, but as the defender of civilization against the barbarism of the Slavs; and in the famous interview between the two men at Erfurt the poets admiration was reciprocated by the French conqueror, who afterward exclaimed: "Voilà un homme!". Thus Goethe had no great sympathy for the war of liberation which kindled young hearts from one end of Germany to the other; and when the national enthusiasm rose to its highest pitch he buried himself in those optical and morphological studies, which, with increasing years, occupied more and more of his time and interest. In the year 1815, he was made minister of state. After the death of the grand duke in 1828, he lived much in retirement, occupied occasionally with poetry, but much more intensely and constantly with the study of nature and the fine arts, which from his earliest years had possessed the strongest attractions for him. He died in March 1832, in his eighty-fourth year, shortly after completing the second part of Faust.